So let us look at Education and its role in society, and try to find out why so many people are unhappy about the state of school systems globally. Clearly, education has an important role to play in the 21st Century. The problem is that no-one yet knows exactly what it is and education systems across the world are not changing to meet it. Everyone over the age of sixteen (at the time of writing) was born in the 20th Century. Manufacturing industry was the great powerhouse of the country and it was a mass employer of both skilled and unskilled labour. The school system was designed to provide a literate workforce for industry - from unskilled workers, through technical and parctical skills, to leaders and managers. It was a carefully constructed system that selected children and guided them to a future role in the world of work. The ultimate aim of the school system was to enable young adults to get jobs which matched their abilities and it reached its pinacle with the 1944 Education Act. Unfortunately (and it will come as no surprise to anyone) the Act’s proposals were never properly funded so the latter half of the twentieth century involved tinkering with types of schools, a process which is continuing today. It all began with the 1870 Education Act, when for the first time in history, every child had to attend compulsory education to learn basic literacy and numeracy. It was know as “Reading, ‘Riting and ‘Rithmetic” and become dubbed “The 3Rs”. Children learned by rote until they had mastered basic literacy and numeracy. There were also some craft and needlework activities but the 3Rs were the core of the curriculum. Most children left school at twelve years old to begin work in the factories, shipyards and mines which were mass employers. No secondary education for them and no gap years or further education for the masses. Pretty well every sphere of manufacturing and mining was very labour intensive and most school leavers went straight into manual work which continued until they retired or died. Health and Safety was poor and the was no pension system so in most cases their work was their life. By the time of the Second World War, the school leaving age had been raised to fourteen and education had gone beyond basic literacy and numeracy. The industrial world had become more sophisticated and needed a better educated workforce so a new Education Act - the 1944 Education Act - was enacted. secondary modern schools for the unskilled workforce. Elementary education still focused on numareacy and literacy but with a wider curriculum surrounding these, but it concluded with an examination taken by all children at the age of eleven. Known as the “Eleven Plus” this set of test papers was designed to select children for the typoe of secondary school which was best suited to their abilities. The test had papers in mathematics and English and measured largely academic ability. Problem solving in mathematics was included but there really was little to identify those with practical or creative skills. Little has changed today. Academic ability seems to have some god-like importance and everything else is regarded by the establishment as of less importance. So in the event, grammar schools were well funded, very few technical schools were built and secondary moderns were underfunded from the start. I was born in 1945 and I was taught to pass exams until I could obtain a job for life with a pension. Failure to do so would mean a life of drudgery in a factory and I can still vividly recall my panic when struggling in one of the maths papers, knowing that if I didn’t pass the 11-plus my life hopes would be over. This underlying principle still drives Ofsted and the present education system. But society has now changed radically. We no longer live in an industrial economy where heavy industry absorbs millions of school leavers to stand along production lines producing the goods we buy. Robots control the production lines where once hundreds of people performed repetitive tasks. 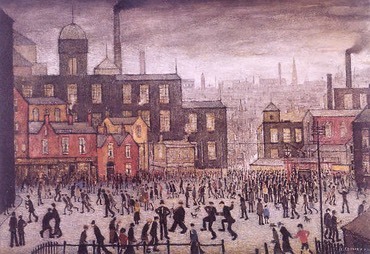 What has become of the millions of workers who trudged to work every day and were captured in Lowrie’s paintings? They are not all unemployed as was once feared. The knowledge industries have generated new jobs - like web design and app creation - that we could never have been imagined in our youth. Even the idea of a job for life has disappeared. The pension industry is in a state of crisis and zero-hour contracts are common. These are signs of profound change. Change so deep rooted and widespread that the education system must adapt so that children leaving school today are not seeking traditional jobs but have entrepreneurial flair and self motivation that will take them into new and uncharted waters. This page has looked back at how our educatioin system has evolved. Now we need to look forward - and that is much harder to do. The problem is that we can never foresee what is to come. I’ve teased out this idea in much more detail in another section of my website here. (There’s a link at the foot of this page too). In this section, there are just two more pages. One is an article about a fascinating experiment called the “Hole in the Wall Computers” which is well worth reading. It illustrates how modern children do not need to be taught and tested on fixed content. Wildly new ideas can really work. We need creative thinkers to develop new methods of teaching and new forms of educational establishment. The last page is basically a link to an excellent website which documents the entire history of education. The needs of education in the 21st century are now down to you. What is the new curriculum that we so desperatley need? What should schools look like in the future? Are physical schools the best way to educate the next generation? The debate is raging. Join in and play your part in shaping the future. Look at the changes that society is undergoing as computer technology transforms us from inductry to information (separate section of my website).